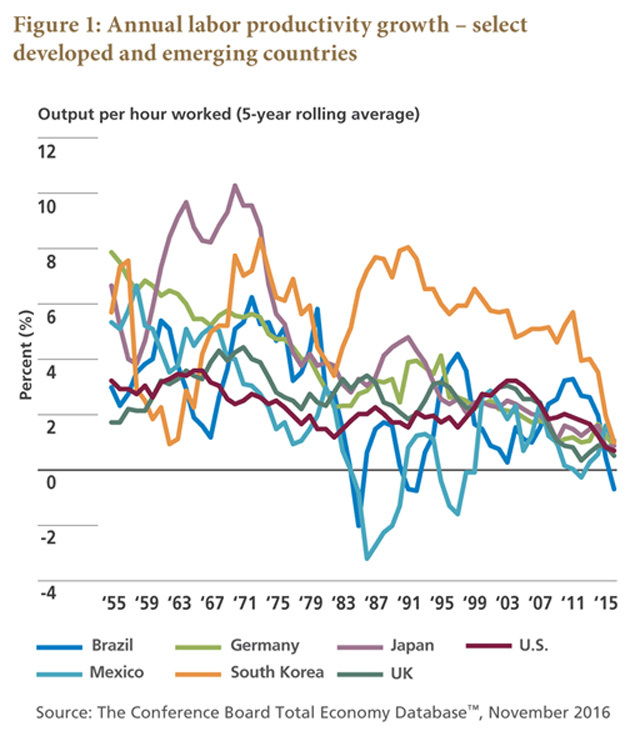 One of the true conundrums in the macroeconomic world is the continuing drop in total global productivity over the last few decades, in spite of the growing use of computers, robotics, and artificial intelligence. Theoretically, productivity should have gone up. Professor and Nobel laureate Robert Gordon and others have speculated the GDP growth is going to decline to less than 1%, and they have all sorts of maps to back up their claim. I’ve taken issue with their reasoning, but they makes great points. And then we come to today’s Outside the Box. Matthew Tracey and Joachim Fels ask the intriguing question “Productivity: A Surprise Upside Risk to the Global Economy?” Using microeconomic rather than macroeconomic analysis, they lay out a path by which they think it might be possible for productivity to actually rise over the coming decade. While that would be a pleasant surprise, they also include one scenario in which that productivity growth actually has a negative social impact. This piece truly qualifies as an Outside the Box article in that the authors take a nonstandard approach, reach conclusions that are outside the bounds of consensus, and make us think. In a first in the 15 years I’ve been doing this letter, I am actually going to briefly comment at the end of this piece rather than at the beginning. But I’ll say this right off the top: You really want to take some time to read this and think about it. (It’s a little longer than some, but not that long.) This is the heart and soul of the debate about where GDP and profits and jobs – everything we hold near and dear – are going over the next 10-15-20 years. This is at the very center of my research for my book on how the next 20 years will turn out, so I have done a great deal of thinking about it. I will try to keep my remarks at the end brief! In a few hours I have to retreat to the kitchen and start my chili and prime, as I have roughly 20 people coming from all over the country for dinner. If you are an independent investment advisor or broker and would like to know more about the new Mauldin Solutions Smart Core ETF trading program (and maybe enjoy some pretty awesome chili) just go to the website, give us your name(s), and in the place where you get to make comments, just let us know that you would be interested in coming to Dallas. I will send you the white paper on my thoughts about diversifying portfolios by diversifying trading strategies. Anyone can look at the paper and browse the website. And maybe I’ll try to round up a bigger chili pot and invite more people. Somebody on my team will get back to you. The world seems to be speeding up, day by day. In less than two weeks Shane and I will fly to St. Thomas and get married, then spend some quality down time for a week or so. But until then I am as busy as usual, so I’ll hit the send button and wish you a great week! The productivity question couldn’t be more important. After all, there are only two ways to grow an economy: boost productivity, or grow the labor force (demographics). And we’re certainly not going to get much help from demographics. Fortunately, the upside potential for global productivity is growing (or, in economist-speak, productivity’s “right tail is getting fatter” – referring to the rising probability of a positive surprise in the range of outcomes). You might never recognize productivity’s upside potential, however, looking through the lens of macroeconomics alone. So let us look instead to microeconomics (sacré bleu!) for insights. Our thesis in a nutshell: Don’t rule out a global productivity rebound in the coming years that ushers in “old normal” (4%+) global growth. While a strong rebound is not PIMCO’s baseline view, it’s a tail that is fattening – and the microeconomic catalysts may have arrived. Productivity pessimists typically blame secular stagnation for the slump. Here, the arguments fall into two camps. “Demand-side” secular stagnation devotees, notably Larry Summers (a guest speaker at PIMCO’s upcoming Secular Forum), suggest that a chronic deficiency of aggregate demand and investment is responsible for the dismal productivity growth we’ve seen in recent years … and that absent a rebound in demand, we’re doomed to more of the same. Meanwhile, “supply-side” secular stagnationists such as Robert Gordon believe innovation today isn’t what it used to be and that productivity gains from the computer revolution (formally, the “information and communications technology” or “ICT” revolution) have mostly run their course. These supply-side pessimists argue that today’s innovations are mostly non-market – namely they help us enjoy our leisure time, but that’s about it (think iPhones loaded with fancy new apps). Gordon himself has suggested that “The future of technology can be forecast 50 or even 100 years in advance” and that he sees nothing on the horizon that will rival the breakthroughs of the past (see references list at the end of this paper – Gordon 2014). How? A handful of technologies have emerged that are radically changing the way firms do business. These technologies – offspring of the computer revolution – include artificial intelligence (advanced robotics), simulation, the cloud, additive manufacturing (3D printing), augmented reality, big data, microsensors and the “internet of things” (web connectivity of everyday objects). These technologies are now being used, in many cases for the first time, in synergy with one another. Together, they enable businesses to experiment more effectively, better measure their activities in real time, and scale their innovations – and those of their peers – faster. (See the works of Erik Brynjolfsson and Andrew McAfee for more.) Here’s the key: Smarter experimentation plus faster scalability of winning ideas can speed up the diffusion of best practices from productivity leaders to laggards. And global “catch-up” potential is huge, especially in emerging markets (EM). 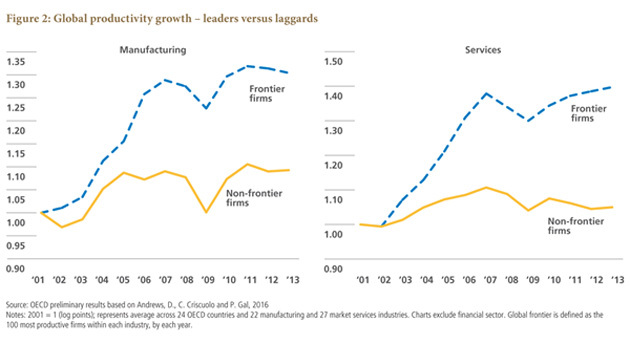 The productivity gap between leading, “frontier” firms and all others has widened dramatically in recent years – see Figure 2. (Note: This gap does not merely reflect productivity differentials across industries.) The gap cannot widen forever; inefficient and unproductive firms can play defense for a while – creative destruction takes time – but eventually they will converge toward the frontier or exit. This growing divergence between leaders and laggards represents strong pent-up productivity gains waiting for a catalyst (… read on!). What about notoriously low-productivity service industries? Boosting productivity growth in services will be critical given these sectors’ rising share of global employment. Here, we see new hope for productivity gains through catch-up, consolidation, or exit – mainly due to the huge productivity gap between leaders and laggards (as shown previously in Figure 2). But again we ask: Why now? Greater use of computers, web technologies and analytics (the stuff manufacturers adopted long ago) is opening up services to greater competition – both domestically and internationally through global trade. (As evidence, consider that across countries, the value-added share of domestic services in gross exports has been increasing at a faster and faster clip as services become increasingly tradable. The “micro-multinationals” are coming.) Bottom line: In services, productivity gains through basic IT and digitization may still be in their infancy. Retail: 3%–4%. Global retail is ripe for creative destruction (consolidation, exit, or catch-up) given massive productivity gaps between retailers within countries and between retail sectors across countries (e.g., Japanese retail productivity is only about 40% of the U.S. level). The catalysts for change? In the McKinsey scenario, advanced analytics and big data will drive improvements in lean-store operations and supply-chain management. Competitive pressures are mounting, notably from the continued rise of e-commerce (80% more efficient than modern brick-and-mortar yet still only a small fraction of total retail activity – about 10% in the U.S.). “Modern” (i.e., large, as in not your local mom-and-pop) brick-and-mortar formats themselves are three times as productive as small, traditional stores – yet modern brick-and-mortar businesses are rare in much of the emerging world (where they represent a 25% – and often lower – share of total retail employment). So, what should we expect going forward? Secular stagnation or a productivity rebound? Our crystal ball isn’t that good. But whereas many market participants are coalescing around a secular stagnation baseline view, we are decidedly less convinced. 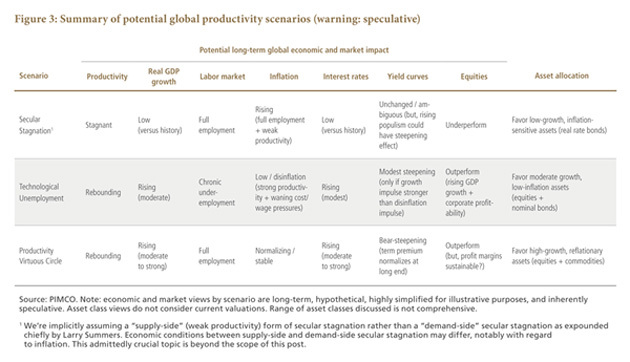 In fact, we see a growing risk that we collectively underestimate the global economy’s pent-up productivity potential. It wouldn’t take a leap of faith to envision some variant of our “Technological Unemployment” productivity rebound (putting aside, in this note, its potentially serious social consequences). If future innovation displaces low-skill labor first, as we suspect it will, the impact on employment could indeed be negative – absent herculean worker-retraining efforts. June 15, 2017, 3:57 p.m. Besides the fact that automation will kill millions of jobs for people, and that these robot workers do no buy “product”, the article didn’t touch on 2 aspects that I believe are far more worrying. One, the decline of the human population. Over the next 50 years, the Baby Boomers will die off leaving a rather massive hole in the consumption area, while those coming behind will be left with a massive cost of living bill due to the $220 Trillion Debt Monster our fearless leaders have created that grows ever so relentlessly. And are one half of the Earth’s population, i.e. China, India, Brazil and other Third World (read: poor)countries going to pay for that debt? Not likely! So, where then, does all this productivity come from and who, exactly, is going to afford this massive increase in productivity when everyone is being Ubered out of their jobs??? Productivity in the past increased because the Earth’s population was increasing, unlike today where that trend is reversing. So, call me a pessimist if you must but really, I’m a Realist. I don’t see two giant trends that portend misery rather than sunshine and blue skys being conducive to greater productivity. Or, maybe like John says…Somehow, we’ll muddle through! June 15, 2017, 12:14 p.m. The productivity we need is to get rid of parasites, in the financial, insurance, and real estate sectors. We need to get rid of elites, get rid of wasteful billionaires and their wasteful lifestyles. We need to get rid of parasites on Wall Street to improve Main Street. The computer can eliminate government, Wall Street, Universities, education, and most of our over head the way elites want to get rid of drivers for their cars. The productivity revolution we need is to get rid of college graduates, public school teachers, bankers, brokers, owners, Wall Street, and government employees. For some reason elites only think laborers should be exterminated by machines. The BIG productivity gains will be in eliminating over head, bricks and mortar, cars, houses, management, not labor. Labor has already been downsized by exporting jobs. This begs the question. Where will children work, support them self, and buy into the system? Families will decline, as they have since 1966. My concern is the inefficiency of our fake currency. In real silver dollars there has been ZERO GROWTH in Dow Stocks, since 1966. Dow was 995 US silver dollars in 1966 and in 2016. It’s a fake counterfeit currency manufactured story. We have fake news, fake television, fake lives, fake newsletters, that are not productive. It is unproductive to eat out, take airplane vacations, and have babies. That is why educated people stop having babies. Unproductive. We are sowing the seeds of our own self destruction. How can we fix that productivity problem? Globalists want Communism 2.0 to homogenize all the world. Is that “productive”? Will first world and third world nations be inter bred for “productivity”? We should all be working a four hour week with all the productivity gains but the elites took the gains. This is a problem in an inflated counterfeit currency economy. What to do? June 15, 2017, 9:34 a.m. I have said for years that the population growth is ruining our economy, while most economists think that growth will equate to more production and earnings. We now see that it is just the opposite, but try telling that to most people who consider population control as a sacrilege. This planet cannot survive the excessive growth rate of the past one hundred years.